This week, I wanted to choose a flower that wasn’t yellow, which tends to be the dominant colour at this time of year. 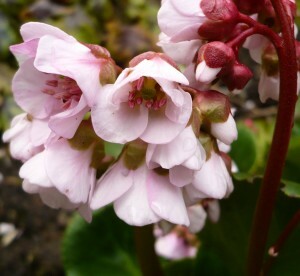 So I picked Bergenia. 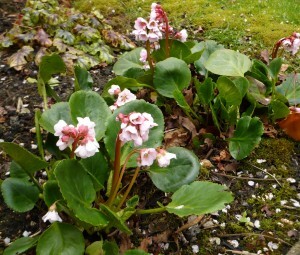 Some people absolutely hate Bergenias, or ‘Elephant’s Ears’ as they are known. Those huge, leathery leaves! That repellent bright pink! If, like me, you have a difficult patch in the garden, a patch which I’ve named ‘the death bed’ because it seems to kill anything I put in it, Bergenias can be your friends. Plus, as you see from the photos, they don’t have to have huge leaves or be a vivid pink. This variety is Bergenia ‘Harzkristall’ and was a great bargain: £2.00 from the nursery sale and in such a big pot that I was able to split the plant immediately. So far it’s put up with being in the shade, in a poorly drained bed and, last winter, actually sitting in standing water. I love that you have a part of your garden that you call the 'death bed'! I had a couple of those in my last gardens - too shady and dry, too shady and wet, or just too something. 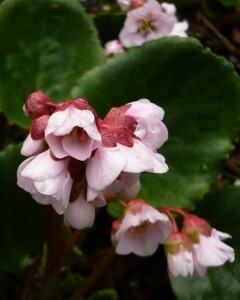 The Bergenia you have is lovely. I like the pale pink color. Hee yes, nothing is easy for gardeners. Glad you like my flowers; I think they're very pretty. Until yesterday I had always loathed bergenias, but yours has converted me. I can't find anyone selling 'Harzkristall' near here (in Rutland), from the Plantfinder but I have deathbeds to accommodate so the hunt is on ... it's like searching for out-of-print books, really. Anyway, thank-you for introducing your followers to such a wonderful plant. Plant hunting is always fun! Good luck with your search. There are white bergenias, too. Thanks. They make a change from daffodils!